This very special free concert has a number of amazing things going for it. Not only does it showcase a sampling of the various musical talent Berkshire, and Reading in particular, has to offer, and not only does it show how it’s possible to mix genres interestingly and successfully, but the fact that it has happened at all is astonishing in itself. Readipop (Gavin Lombos, Russ Alsop and Phil Hopkins) had the idea one day to combine the skills of some of the young MCs and producers they’d worked with with a live orchestra. An ordinary enough idea, you might think, and one that we’ve all had I’m sure, but herein lies the difference between ordinary people and the Readipop guys – they went away with that idea and, well, did it. Combining forces with Berkshire Maestros they brought together a powerful group of musicians, capable, and moreover willing, to take part in an experiment which could have, quite easily, turned into an appalling shambles. But it didn’t, as this evening’s performance shows. The first half of the programme is fairly straightforward: a few pieces performed by Berkshire Youth Brass; a couple of raps from a pair of local crews and some impressive beat-boxing from Beefbox; and finally the Berkshire Youth Orchestra take the stage with Sibelius’ Symphony No. 1 in E minor. While it may be that this last choice is a little overlong for some of the audience, who are somewhat less respectful (read, silent) than a well-trained classical crowd, it is beautiful, vibrant and contains enough complexity to, hopefully, by itself convince a few of the new faces here that classical music is far from stuffy and unexciting. The second half of the programme, however, is what everyone has been waiting for. Here is where the collaboration occurs, where The Urban Orchestra itself is unveiled. The piece, a symphonic tone poem, is called Any Given Saturday… and apparently describes a typical Saturday in the life of an average kid. The three movements begin with morning, where the orchestra mixes standard dawn motifs and lyrical passages of waking, dozing, sleeping late with the musique concrèteof birdsong, street noise, alarm clocks, mobile phones. The weaving together of the real and the ideal works well, is bright, witty and intelligent and is clearly a step beyond being a gimmick, which is a trap it could’ve easily stepped into. The second movement, the afternoon, begins with a bus ride into town, on which the first vocals appear – actual singing, mixed with spoken snatches of conversation, making the passage sound something like an interesting version of The Streets. The final movement, which takes in the evening and the trip home, begins in the Forbury Gardens, evoked by a magisterial arrangement of Sumer Is Icumen In, this is overtaken and embraced by the electronic drums and we’re treated to some Mcing, which set over a melody and backed by the orchestra and given a context is remarkably fitting and more successful than I might have expected. Eventually a driving rhythmic heart-pounding climax is reached late at night, avoiding trouble, fights, and rather sadly, though not, perhaps, atypically, the piece ends with a police siren dopplering into earshot. What is so remarkable about this very enjoyable piece is how, according to the credits that roll on the screen (which has, incidentally, been display still images to coincide with the programmatic nature of the score), it has been composed, arranged and performed by students and teachers from Highdown and Blessed Hugh Faringdon schools, the John Madjeski Academy, musicians from Berkshire Maestros and ‘Reading’s most open-minded young urban MCs’ – and yet, never for one moment does it seem a compromise has had to be reached about any aspect of it – it feels consistently dynamic, and unified both in aim and in content. To get so many people involved and to not end up with a beige blandish lump is a remarkable achievement for all involved – and the fact that it was a fascinating, witty and moving piece as well speaks well for Reading’s musical future on all fronts. In comparison to previous Projects you have worked on as a Music Leader, What has it been like working on the Urban Orchestra ? PHIL It’s been good. I’ve had the opportunity to work with a different set of young people and some new music leaders. I’ve particularly enjoyed having the opportunity to work with John Watts who I think is someone who has brought an enormous amount of talent and hard work to this project. It’s also been a unique project in the sense that it’s developed into something quite ‘big’ in terms of a final performance and I think the anticipation and excitement of that really drove us on in the final stages of the project. GAVIN More challenging and more rewarding. Mostly the participants have been more musically able so we have been able to explore much more interesting ideas and produce higher quality work. This project was bigger than anything Readipop has tried before in terms of the number of participants involved and all working together at the final stage of the project and in the performance. This has meant greater challenges in terms of admin and coordination which has stretched our capacity to the limit. JOHN It has been very challenging but equally rewarding. Working with a cross section of students from different cultural and musical backgrounds and trying to bring them together. Previous projects have been with either students of a younger age group (in many ways more receptive to new ideas and less prejudiced in general put particularly about different types of music) or like minded students (for instance in a brass band). This project was ultimately about breaking boundaries and making people receptive to new music, something entirely new to me. Do you think working on the project has developed your music leadership skills ? If so, how? PHIL Yes, but not necessarily in a way that I might have expected. I’ve more regularly been asked to lead sessions and that’s been good. Possibly through the diminished amount of time that I have had to contribute to the project, I don’t really think of myself as having really been a leader in terms of the overall piece. In summary, I’d say my involvement has been more programmatic rather than strategic. RUSS Practise makes perfect. It was nice to exercise my musical knowledge in a more formal way. GAVIN During the project I have had to compose a string quartet piece, compose timpani and percussion parts and score parts from ideas played by participants and read a full score to assist the conductor – these are all skills that I haven’t exercised for quite a few years! The key area for development for me has been in working in partnership with orchestral tutors and in using classical/orchestral ideas within the work we created. JOHN Definitely. It has given me a much greater understanding of working in larger groups of an older age group. As outlined above it has made me question how to make people more receptive to both classical and urban music. Working outside the type of students I normally work with in the older age group for Maestros showed up different aspects of teenagers’ behaviours and attitudes. Do you think involvement in the project furthered participants musical development? If so, how ? PHIL Yes, through exposure to different types of music and by asking and encouraging young people to write and perform all the music and lyrics (in the case of the latter, sometimes relating to subject matter that they might have otherwise avoided). Equally, despite the project having run over several months, it did feel rather compressed towards the end, but the fact that the young people were able to deliver such a high level of performance under pressure was great. RUSS Yes. By experiencing new genres of music and the people who make them the project has a. Taken the participant out of their comfort zone and b. opened their eyes. mind to that being different doesn’t nessccersarily mean better or worse. GAVIN By involving them in something completely new! – None of the participants will have done anything like this before. The those that stuck with it will have a better understanding of how a complex piece of music evolves through a number of stages and how the the devising and composing process relates to the rehearsal process. They will have seen how some small ideas can become integral parts of the work and how some bigger ideas can be dumped in order to create a stronger piece of music. FAFA It allowed them to apply their learned knowledge in music making. Seeing and hearing their composition been performed in a live concert. JOHN Having heard comments from both the classical and Urban musicians I believe it has opened their eyes and ears to different ways that they can use the musical skills they already have. The achievement of a ground breaking performance, composed by themselves also will have given them great pride and satisfaction. Every student I spoke to was so excited by the end result and asked if something like this would happen again. PHIL Definitely. In the case of the urban musicians, this could have been perceived as a big ask since I doubt many of them are that regularly exposed to classical music or musicians. They displayed a great deal of professionalism and performed exceptionally. It was pleasing to see so many young people from different backgrounds just get on with the job, displaying a respect for one another, a respect for what was sometimes a challenging process and a real sense of coming together. I think too that we need to recognise the exceptional contribution of some of the players (both classical and urban) who demonstrated leadership and real flexibility throughout the process. RUSS Yes. Confidences grew, making mistakes and then getting better through practise. Understanding that one is part of a whole helped team working. FAFA Mostly the confidence factor in many performers in the orchestra. JOHN Yes. I think projects like this bring people together through working for a common goal. One teacher (Head of Music at Hugh Farringdon) said the students would usually split into same musical genre groups for composition lessons. We forced them to mix with people they probably wouldn’t normally be with. This in turn led to a greater understanding of different cultures and musical styles and genres. PHIL It may sound clichéd, but I think for the young people and music leaders alike, this has been a bit of a journey. At the project outset, we had little idea of who we may end up working with and I think that this has lent an ‘edge’ to the entire project. Sometimes, this uncertainty has caused us to have to re-think and plan in real time and I’m pleased to say that given this, I think we were all quite proud of the final outcome. RUSS The weak points were where we had to work with teachers and others who had little capacity to set up and find the participants for all of the sessions, or to ensure that all communications were dealt with. Overall a much more fulfilling and interesting project which I believe will have far more long reaching benefits to those who stuck with it than any other project I have been involved with. GAVIN our best project so far. FAFA I am very glad to have been involved in this project. It gives me the chance to open up my approach and thinking in future project. There are many things could have done better, however the final result was a very positive one. It proved to many the true value of instrumental teaching Berkshire Maestros do week in and week out over the years. JOHN I think the above outlines many positive experiences and I’m not sure of any very negative ones. There are things that we may have done differently if we did this again but it was all new so really that is a positive as we have all learnt new things. The difficulty in working with disparate populations of musicians i.e. from different schools was sometimes tricky to administrate but this was overcome. Do you think the urban orchestra could develop your musical skills, if so , how ? 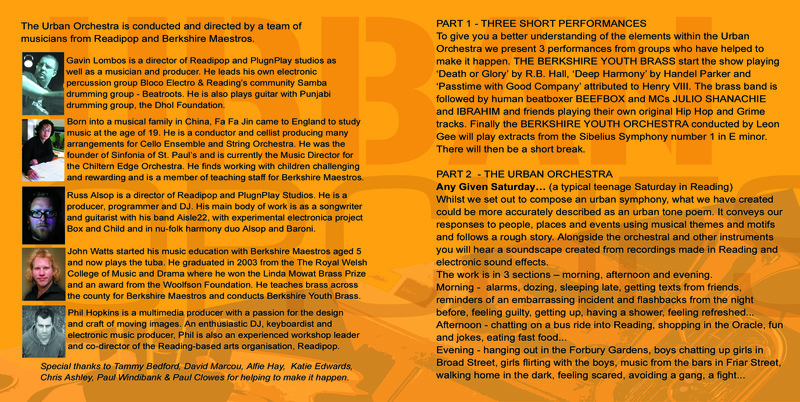 14 MID PROJECT VERBAL FEEDBACKS FROM REHEARSAL WEEK…..WRITTEN NOTES…. 21 FEEDBACK FORMS COLLECT AT THE END OF THE CONCERT . .
What did you think about your time as a member of the Urban Orchestra ? Was it different to other music projects/activities you take part in ? WILL DAVEY, 14 very different, I used different beats when I was drumming.i enjoyed it because we mixed music. BEEFBOX (BEATBOXER,MALE) it was a privelage.one of the best collaborations I ever feel is classic and urban.should be an annual thing!! RAPHAEL KEMP, Mc yea, it was different to what I usually do but I found it very fun and enjoyable and its given me a wider range of my music and how it works. MELANIE POWELL, 16 this was different to anything I had done before and has been a good experience for me. it’s shame I couldn’t have been involved more. L DABROWSKI, 19 I think it was very different due to the power of the orchestra. It was a new experience for me. EMILY MEANEY, 15 I thought it was awesome, its so good when we get the chance to play something that’s not classical music..WOOOOO!!! Do you think the urban orchestra project developed your musical skills ? if so, how ? DOUGIE CHATTS 21 MC complete pressure! !writing skills improved.different styles of performance style. FIONA THOMPSON, 15 counting rests. SARAH BROWN, 16 yes because I had to know exactly where to come in and who to listen to. EMILY MEANEY, 15 I met new people who love music and are really great people.had a great time.RAAAHHHH!!!!! What did you think of the Music Leaders and how they ran the project ? ALEX LANGUAGE 21 MC we were only there for 3 days so didn’t see much.nice guys. DOUGIE CHATTS 21 MC yeh it was good, all came together in the end but a little rushed. BEEFBOX (BEATBOXER,MALE) they knew what they were doing.genius!! AMY PATTEN, 15 it was well organised and interesting. especially the way we got fed. If Urban Orchestra was to continue, would you like to be involved ? 14 out of 21 said yes. ANTONIA KESEL, 14 thank you ! TAHIRAH ANDREWS, 11 I would hope it continues because because it’s good to develop your music skills, to socialise. EMILY MEANEY, 15 wahoo …buzzin!! VICKY TAY, 15 it would be good to be involved more and yeah maybe we should ask someone else to get pizza next time…NOT FRAN!